A health care worker disinfecting a taxi in Liberia at an Ebola treatment centre. The United Nations Security Council will hold an emergency meeting on Thursday to discuss the Ebola outbreak that has gripped West Africa, the president of the 15-member body announced today. The outbreak, affecting Guinea, Liberia, Nigeria and Sierra Leone, is unprecedented in scope – with more than 4,000 cases having been reported across the region and over 2,200 deaths. It has also dealt a major blow to the already fragile health care systems in West Africa. “The trend lines in this crisis are grave and without immediate international action we are facing the potential for a public health crisis that could claim lives on a scale far greater than current estimates and set the countries of West Africa back a generation,” Ambassador Samantha Power of the United States, which holds the Council’s presidency for September, told reporters at UN Headquarters. The meeting – requested by the US owing to the “increasingly grim situation,” particularly in Liberia, Sierra Leone and Guinea – is expected to hear from Secretary-General Ban Ki-moon, as well as senior UN officials dealing with the Ebola crisis. “At this moment, it is crucial that Council members discuss the status of the epidemic, confer on a coordinated international response and begin the process of marshalling our collective resources to stop the spread of the disease,” stated Ms. Power. Also today, the Council adopted a resolution extending until 31 December 2014 the mandate of the UN Mission in Liberia (UNMIL). In doing so, the Council also urged the international community to respond swiftly to the shortage of qualified medical professionals and appropriate equipment and preventive measures necessary to address the Ebola outbreak in West Africa. 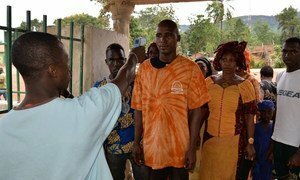 Briefing the Council last week, the Secretary-General’s Special Representative and head of UNMIL, Karin Landgren, told the Council of the “merciless” spread of Ebola, which has already claimed at least 1,200 deaths in Liberia. “The speed and scale of the loss of lives, and the economic, social, political and security reverberations of the crisis, are affecting Liberia profoundly,” she stated. Also last week, Under-Secretary-General for Peacekeeping Operations Hervé Ladsous pledged during his visit to Liberia that the UN will continue to stand by the affected countries as they battle the Ebola outbreak. “It is true that we, the international community, have invested a lot over the years to bring back peace and security to Liberia, and, more generally, to West Africa. And it is even more true that we do not want to [jeopardize] that patient work,” he told reporters in the capital, Monrovia. Mr. Ladsous noted that while UNMIL is not a public health operator, the Mission and the wider UN system would be on hand to ensure Liberia moves beyond the current crisis. We are not leaving Liberia. We are here to stay the course and to help the people of the country and their neighbours get through this terrible crisis,” he said, adding that all 8,000 personnel at UNMIL – military, police and civilian staff – would spare no effort towards that goal. Meanwhile, football’s world governing body, the Fédération Internationale de Football Association (FIFA), has teamed up with the UN in its efforts to help control the epidemic. Last Thursday, it was announced that the Antoinette Tubman Stadium in Monrovia will be used to set up two large Ebola treatment units. After the UN World Health Organization (WHO) identified the field as the most suitable location for the treatment units, the use of the pitch for this purpose raised concerns in the local community, who feared the facility could be damaged. The stadium was only recently donated by FIFA to Liberia’s Football Association. According to a news release issued by the UN Office on Sport for Development and Peace (UNOSDP), FIFA quickly pledged its support for the UN-coordinated Ebola response in the affected countries. FIFA will cover the costs of potential damages arising from the use of the field to house the units. It will also consider using resources from its solidarity fund to support the member associations of the particularly affected countries in the fight against Ebola. “The Ebola outbreak also has a tremendous impact on the sport community, ranging from health threats to the athletes themselves and restrictions of travel affecting competitions and the development of sport,” said Wilfried Lemke, the Secretary-General’s Special Adviser on Sport for Development and Peace. “National authorities, the UN and the world of sport need to work closely together in order to halt the spread of the disease. The commitment of sport organisations to support our efforts is very much welcomed and crucial,” he added. United Nations Secretary-General Ban Ki-moon today welcomed signs of solidarity in the fight against the Ebola virus outbreak in West Africa and called on all countries and organizations to move swiftly to support the Governments of the countries affected.